The Olympic Games are a reliable international distraction that arrive every two years like clockwork. And for Americans, these 2016 Summer Olympics have been a cool relief from a bonkers election year. Citizens divided or just fatigued by politics have come together to cheer on the best in their fields. No social issue can unify like the love of Michael Phelps and Simone Biles. So it'll be with a heavy heart that I and other Olympics fans bid goodbye to this games. The send-off is still several days out; there are many more events to watch and rising stars to discover. Rio's closing ceremony will air on Sunday, Aug. 21 at 7 p.m. ET. The conclusion of the global athletic tradition will take place in Maracana Stadium in Brasil, exactly where the opening ceremony was held. Not able to get to Rio or even in front of a TV? Here's how you can watch the 2016 Olympics closing ceremony online. Every Olympics benefits from the tech progressions that have taken place since the last. When I think about begging my parents to stay up late to watch Oksana Baiul's long program in the 1994 Winter Olympics ladies figure skating final because DVR hadn't been invented yet, I could the blessings of 2016 me. NBC has been and will continue to live-stream events so you can access them on your laptop, phone, tablet, or other devices. Back in February, the network promised over 6,755 total hours of streaming Summer Olympics content. That means many an office worker has been practicing their speed on the draw, minimizing the window streaming the archery qualifiers whenever their boss walks by. 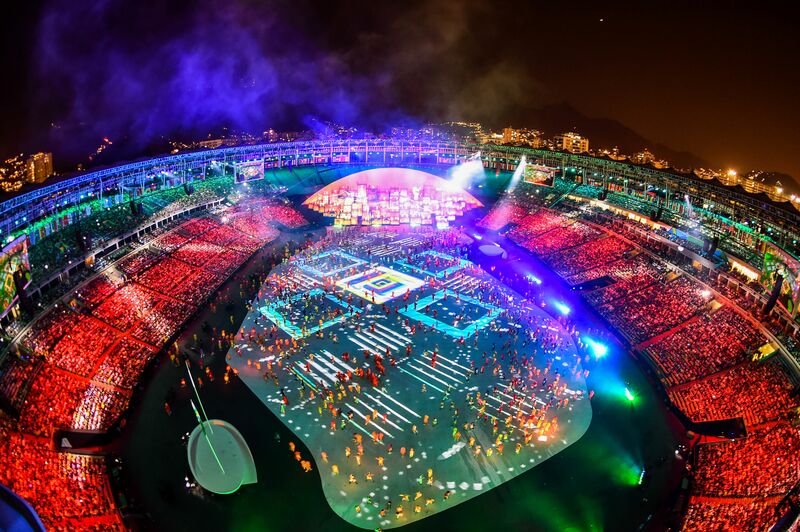 Included in those 6,755 streaming hours is the closing ceremony. Open a tab to NBCOlympics.com on Sunday, Aug. 21 and you'll be able to applaud, laugh, and cry along with the athletes and coaches who found triumph and failure in Rio; plus the proud Brazilians who hosted the games and will have one more chance (for this Olympics at least) to share their history, culture, and unique viewpoint with the world. It remains to be seen if Brazilian soccer legend Pelé will make it the closing ceremony after missing the opening ceremony for health reasons, but the former player tweeted that he is intent on getting there if he can. And you don't want to miss that. There's a catch, because isn't there always? Anyone can stream up to 30 minutes of free content on NBCOlympics.com. After those 30 minutes are up, the site will ask the user to log-in with the username and password they use to access their cable provider. So if you are not a current cable customer, there is no free and legal way to stream more than half an hour of any Rio 2016 happenings, including the closing ceremony. On the bright side, highlight reels and possibly the full version of the closing ceremony may make it on to YouTube in the hours and days following the celebration. Definitely keep an eye out. So far, Rio 2016 has been an Olympic Games to remember. The closing ceremony should deliver in more unforgettable moments.